Stephen King movies have wrongfully attained a bad rep. No matter if the longest reigning film on the IMDB Top-list, and what is globally considered the best movie in history, is based on King's work. The problem is there's just so many other King adaptations, a lot of which are terrible sequels attempting to cash in on minor successes. Children of the Corn 6, Sometimes They Come Back for More, Maximum Overdrive, The Mangler, Dreamcatcher... are all admittedly pretty bad. Salem's Lot on the other hand, is the opposite. 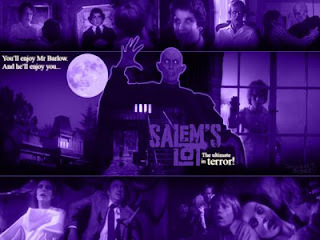 It is King's version of a vampire mythos, and such an epic tale that I would dare say it even rivals that of Nosferatu. Directed by the strange Tobe Hooper, the film retains a haunting atmosphere, that refuses to be forgotten. Nor can I forget the line from King's novel: "There's no life here, but the slow death of days."